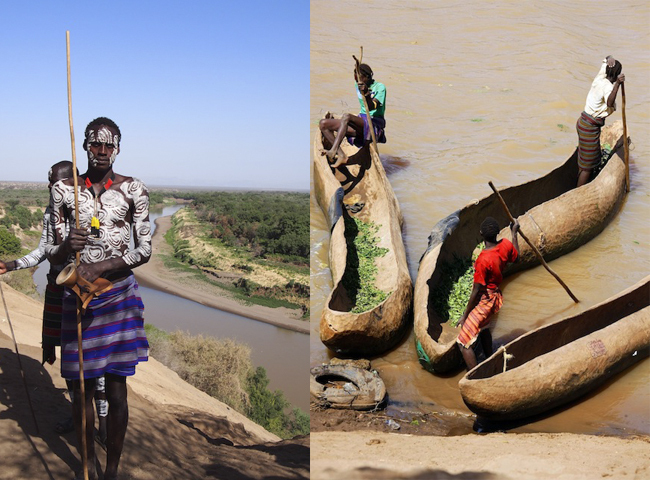 The Omo Valley, in the remote south-west of Ethiopia, is a vast river basin fringed in the far distance by mountains. Life here has largely stood still. No Ethiopia trip is complete without visiting the Omo. There are a number of tribes in the region living a subsistence life with their cattle, goats and some basic crops. Most of the zebu cattle use the dry river beds as highways to and from the Omo, which has the only flowing water in the region. The villages for the Karo and Hamar tribes are divided into family compounds, surrounded by fences made from sticks and thorn bush. If a man has more than one wife, the wives share a house while he lives in a separate dwelling. The distinctions between people from the Karo, Hamar and Dassanech tribes in dress and ornamentation are fascinating, and their behaviour is largely unchanged over hundreds of years. Customs vary between the tribal groups, but it seems that boys get some schooling while girls are completely uneducated by our standards. The Karo men go in for white ochre face and body painting. 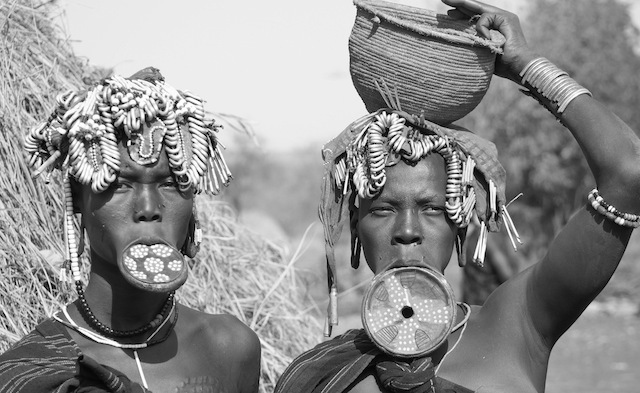 Both sexes pierce under their lower lips to insert a feather or a piece of wood or metal. Boys are presented with a Kalashnikov when they reach a certain age, to defend their families against lions and those rascally tribesmen across the river. Bare breasts and chests are the norm. The women of the Hamar tribe are unselfconscious, and hold themselves proudly aware of their sexuality. They love their bead work, and wear asymmetrical skirts made from tanned goatskin. The older girls and women wear their hair in a helmet style, with a multitude of twisted ringlets anointed with a mixture of butter and red ochre. Most of the men wear abbreviated hip wraps, and they sport a number of head and neck ornaments. The men carve small stools our of acacia wood. These also serve as head rests at night. It’s common to see a Hamar man carrying his rifle over his shoulder with his stool/pillow dangling from his hand. Your Ethiopia trip will be filled with memorable experiences. 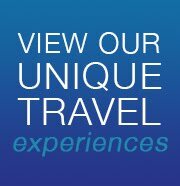 Book your trip to Ethiopia especially for Timkat festival with Blue Dot! Click here.